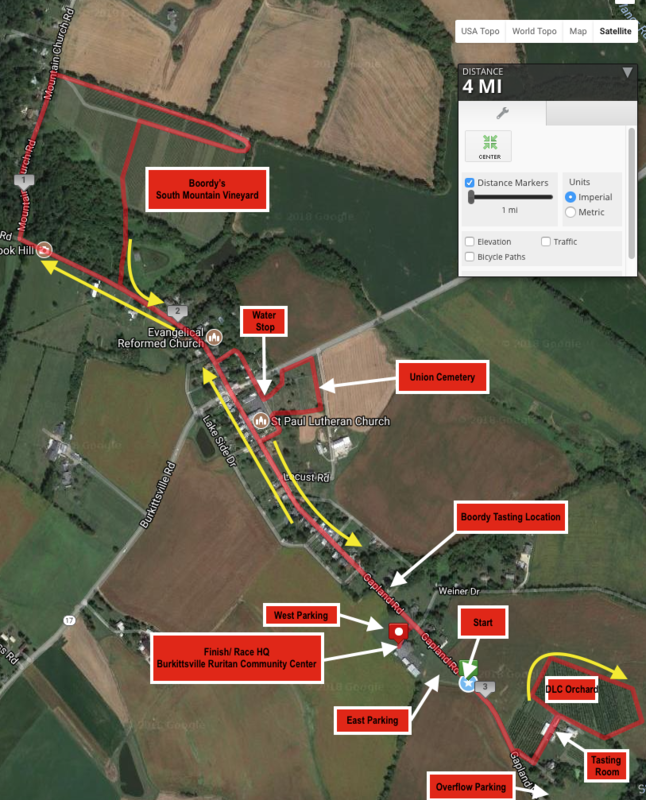 The Spook Hill Cider & Wine 4 Mile Run's rolling, loop course stays primarily within the confines of the historic town of Burkittsville, MD. You will run up the gentle incline of legendary Spook Hill before turning off of the asphalt for a loop through the Boordy Winery Vineyard on the west end of town. While running through the vineyard, you'll be treated to splendid views of South Mountain, painted in its full palette of fall colors. Running through the Historic Union Cemetery in the center of town, participants are treated to sweeping views of the surrounding farmland. A loop through the Distillery Lane Ciderworks orchard on the east end of town brings you to the home stretch. 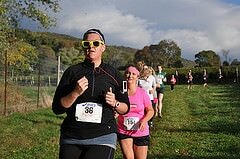 This is a fall race not to be missed as the scenery is second to none! *Note: The vineyard and orchard loops are primarily a grass surface that is not maintained as a footpath so expect typical cross-country conditions on that part of the course. The Cemetery and farm lane portions are loose gravel/asphalt. The owners and operators of the vineyard, orchard and farm have graciously opened their properties to us for this event and for this event only. PLEASE DO NOT PRE-RUN THE PRIVATE PORTIONS OF THE COURSE! Sorry, no dogs or strollers allowed on the course. The use of headphones or earbuds is strongly discouraged. The 2019 race will start on East Main Street in front of the Ruritan and finish on pavement at the Ruritan. Ovarland Timing will be chip timing this year's race, providing finish line video!